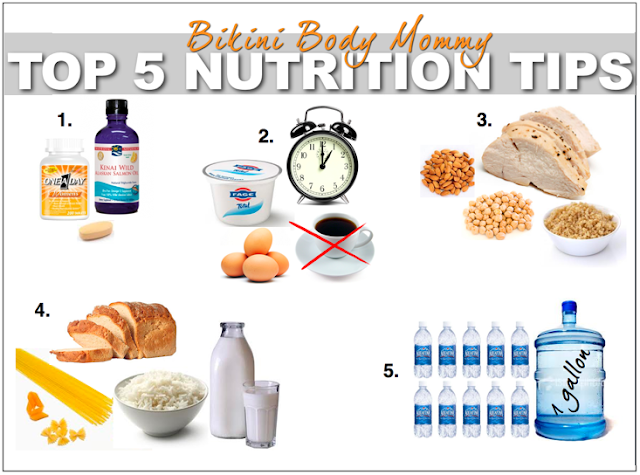 BIKINI BODY MOMMY™ — TOP 5 FAVORITE AB MOVES & NUTRITION TIPS FOR A FLAT TUMMY! "Mother's Apron" ... "Marsupial Pouch" ... "Muffin Top" -- BE GONE! As promised ladies, here are my TOP 5 FAVORITE AB MOVES & TOP 5 NUTRITION TIPS for BANISHING your MOMMY BELLY and Losing that NASTY Lower Ab-Flab ... FOR GOOD! NEW!!! JOIN the BIKINI BODY MOMMY WEEKLY MEAL PLAN for meal plans, shopping lists, recipes and MORE! 2.) Focus on lifting your hips with your abs, only use your arms and legs to brace yourself. Fully extend your legs and try to push your hips backward. Hold for 2 seconds. Then bend your knees and return to the start position. That's one rep. Perform 10 reps. 2.) Keeping your knees locked, walk your feet in towards your hands as far as you can until your hips end up in a high “pike” position. Slowly inch back out, reversing the way you walked in, until you return to the start. That's one rep. Perform 10 reps.
#4: SIGNATURE BIKINI BODY MOMMY "CRUNCH"
2.) Bend your left knee under you and across towards the inside of your right elbow (your hips should turn to the right and you'll pivot slightly on the ball of your right foot). Slide your left leg back to the start position and then repeat to the right. That's one rep. Perform 20 reps. 2.) Inhale, straighten your legs (toes pointing to the ceiling), and lift your hips up off the ground. Exhale and return your hips back down to the start. That's one rep. 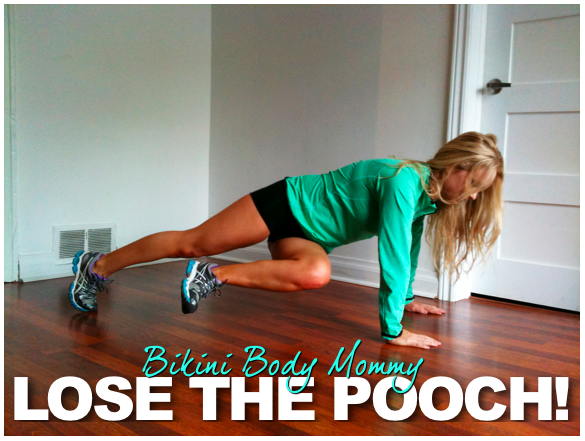 Perform 30 reps.
TOP 5 BIKINI BODY MOMMY NUTRITION TIPS: For a FLAT STOMACH! Implement just ONE of these new nutrition habits from my book the Bikini Body Mommy Blueprint, for 1 FULL WEEK before implementing the next tip. DOSE: Multivitamin - 1 daily like One-A-Day Women's Multi, Fish oil supplement *LIQUID FORM*like Nordic Naturalsor Carlson Labs VERY FINEST Fish Oil -- 1 gram per 1% body fat, but NO more than 30grams. The multivitamin is an insurance policy against nutrient deficiencies -- Most clients come to me deficient in a bunch of vitamins, minerals, and omega 3’s... and if we fix that right out of the gate, we can really hit the ground running! The fish oil has plenty of data behind it that suggests that it has positive effects on the motivational centers of your brain (when taken in the dose I recommend), as well as increases FAT LOSS, and has an anti-inflammatory effect on the body. Why start here? It’s EASY -- we can build up a positive momentum! And If we can actually make an impact the motivation centers in your brain to increase your motivation, in addition to fixing your nutrient deficiencies, increase your fat loss, and help you to be less sore from your newBIKINI BODY MOMMY CHALLENGE workout regime ... you are going to have a better chance of success! (This means-- BEFORE YOUR COFFEE!) Turn your metabolism into a fired up fat-burning furnace FIRST THING! Keep it small and protein rich. AMOUNT: Consume at least half your body weight in ounces, upwards of 1 gallon every day -- NO EXCEPTIONS! 1/2 your Body weight Example: 150lb woman would drink 75 ounces DAILY -- a little over 6 traditional 12oz water bottles. 1 Gallon Example: 10 traditional 12oz water bottles DAILY. Yes, it IS A LOT of water. YES, you'll likely be going to the bathroom every 10 minutes until your body adjusts. If you really want to lose the fat and ditch the pooch that making you feel so awful about yourself -- Deal with it! I cant emphasize enough how important hydration is when it comes to fat loss. JOIN the BIKINI BODY MOMMY WEEKLY MEAL PLAN for meal plans, shopping lists, recipes and MORE! Newer PostMONDAY MOTIVATION. What Inspires You?